In short, the entire media report, beginning with the headline, was centered around the discovery of uranium in Karbi Anglong district of Assam. So far as other rare minerals like the presence of titanium or platinum in the region is concerned, the same appears only as fleeting reference with all focus on uranium. While platinum, titanium and vanadium are indeed rare minerals and hence costly ones, uranium by itself stands on a totally different platform – a platform by itself – because of its absolute requirement, without substitute, in the nuclear sector. Interestingly, the nuclear sector comprises of use of uranium for generation of nuclear energy as well as for manufacture of nuclear arms. That being the high utility of uranium, the disappearance of the high utility mineral from the list of minerals discovered in Karbi Anglong within 24 hours obviously causes one to wonder as to what could possibly be the actual truth. The question obviously arises if an attempt is on to hide the truth from public domain. Has the university authorities come under pressure from the government to deny the presence of uranium in the district? In this context it is highly pertinent to refer to the unsurmountable roadblocks confronted by the authorized agencies of the Union Government like the Uranium Corporation of India Limited (UCIL), the Atomic Minerals Directorate (AMD) and the like in West Khasi Hills (WKH) and South West Khasi Hills (SWKH) districts of Meghalaya in their uranium drilling and mining mission. It was over two decades ago that the presence of uranium in the said region of Maghalaya came to light. Significantly, since day one of its discovery, the people of the region took to opposition of any uranium mining tooth and nail. Citing health ground caused by the fear of possible radiation and such other factors, the powerful Khasi Students’ Union (KSU) and other social organizations have through massive protests over the years prevented the UCIL and the AMD from carrying out their assigned tasks. The decades also witnessed the Khasi Hills Autonomous District Council (KHADC) exercising jurisdiction in the area blowing hot and cold over the issue. By and large the KHADC is opposed to such mining and as of now the issue of no objection certificate and leasing rights to the UCIL by the Council are seemingly hanging fire. On the other hand, over the decades the central agencies as well as the Central Government adopted various ways and means, even to the point of luring the locals with ambitious projects in the region. However, all such attempts proved to be futile with people’s resistance against uranium mining burgeoning with every passing day. Over the last two decades the West and South West Khasi Hills region witnessed countless number of agitations by the KSU and other local bodies, with the KHADC joining hands from time to time, against uranium mining in the form of picketing, road blockade and the like. 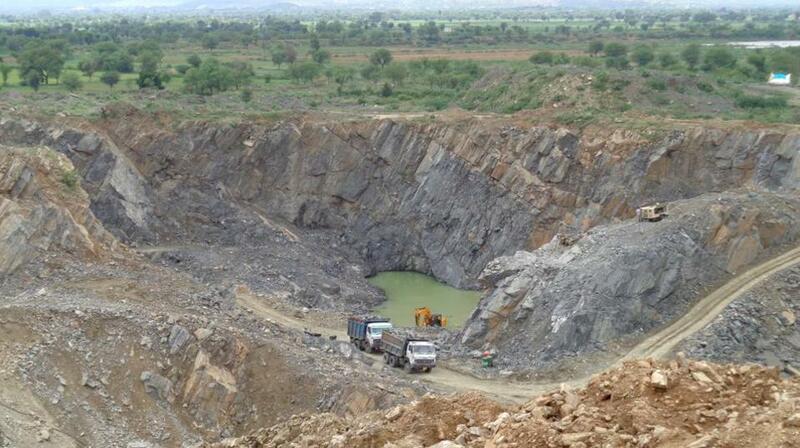 The result being that even after two decades of its uranium mining mission, the Centre continues to be at square one. Further, the agitating bodies like the KSU seem to be totally distrustful of every move made by the Centre in the region. Even Central road projects in the uranium-rich belt is being vehemently opposed by the agitating bodies and the locals on ground that such projects are being mooted by the Centre only for the purpose of creating the necessary infrastructure for unobstructed and speedy uranium mining. Meanwhile, the uranium mining issue in Meghalaya has made its way to the UN Permanent Forum on Indigenous Issues, causing its Chairperson Victoria Tauli Corpuz to state, “Such projects need participation of indigenous people. They should agree that they would like to have such a project on their land,” while urging that the government should seek the consent of the local people before taking up uranium mining in Meghalaya. In the meantime, the AMD recently announced that it would stop exploratory drilling for uranium in the region after three AMD officials were assaulted. On the other hand, as per a communiqué issued by the UCIL, “The UCIL has been compelled to temporarily close down its establishment in Meghalaya.” The communiqué pertains to closure of UCIL offices in Shillong and uranium-rich Wakhyn village in WKH. However, closure of a handful of offices or temporarily halting exploratory drilling can never be construed as the Centre bidding goodbye to its uranium mining mission in the region. Meghalaya, after all, is the third uranium rich state in the country, accounting for 16 percent of India’s uranium reserves with deposits estimated at around 9,500 tons and 4,000 tons respectively at Domiasait and Wakhyn – both in WKH. That being the down-to-earth reality, and considering various overt and covert moves made by the Centre to extract uranium in the region, one may be on very safe ground in presuming that, more sooner than later, the central uranium and atomic energy authorities may come up with new roadmaps for uranium mining in the region. In the light of the total blockade being suffered by the Centre at the hands of the tough and resolute tribal people of WKH and SWKH districts of Meghalaya in the matter of uranium mining, the clarification given, or to be more specific the U-turn made, by the Dibrugarh University official within 24 hours wherein discovery of rich uranium belts in Karbi Anglong district is denied, may only be taken with a huge lump of salt. The denial obviously causes one to guess that the university authorities might have come under immense pressure from Delhi and Dispur to cover up the issue with a U-turn by way of clarification. Having run into impenetrable walls of protest in Meghalaya for over two decades, it is obvious that the Centre would not like to face the same music in Karbi Anglong if the first announcement of discovery of uranium in the district is correct. Likewise, it is unlikely that the Centre or any other authority would ever make any announcement of the presence of uranium in Karbi Anglong, even if the district has huge reserves of the ore. While mining of platinum, titanium or other rare elements in the district may be taken up peacefully by the Centre, if uranium reserves really exist in Karbi Anglong, it may not be surprising if under the cover of mining other minerals, the Centre goes ahead with uranium mining, while keeping the public in the dark. After all, the Centre would not like to see the emergence of another West Khasi Hills in Karbi Anglong. It now remains to be seen as to how the people of Karbi Anglong react to the emerging scenario.